Hey everyone! 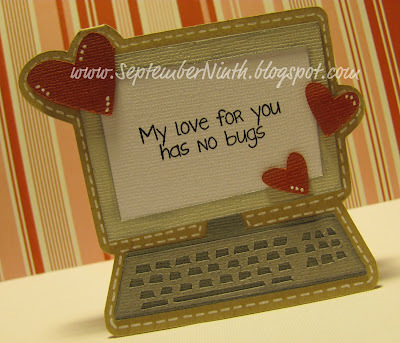 It's Ruthie from SeptemberNinth, I have a fun "lovey" card for you today! Jaded Blossom's stamp set called "Nerd", is the perfect sentiment stamp set for you! For more photos and info about today's card, click here! This is so cute. Love that computer die cut too and that sentiment is perfect. this is tooo cute ruthie.....you know everything to say to capture cansaces heart LOL ! Oh Ruthie!!! This is sooo super CUTE!!!! Ha-ha, this is so cute!!! Ruthie this is so fabulous!!!! I love it.